My experience as a consultant has mostly been in the manufacturing sector and no wonder, I had frequent encounters with the notorious LastNonEmpty aggregation type in SSAS. I wouldn’t be exaggerating if I say that I had struggled quite a bit to understand and adapt this aggregation type to my needs when dealing with inventory, stock and status related data. I had dealt with varying scenarios but never thought of classifying these findings until a chance discussion with Javier Guillen (blog | twitter) prompted me otherwise. Together, we went through the scenarios and tried classifying them as well as applying them to the tabular mode and this post will be the first part of that effort. For the sake of simplicity, we adapted our discussions to the manufacturing scenario and the key dimensions used in the explanation below would be Time, Store and Product. However, this can be easily translated to other scenarios where the LastNonEmpty might be required. The LastNonEmpty (LNE) scenarios can be broadly classified into 2:- the typical Last Non Empty behavior of SSAS (where you would want to find the last non empty value within the selected time period) and the Last Ever Non Empty (credit for term usage – Chris Webb in this post) behavior (where you would want to find the last non empty value from all preceding time periods instead of just the selected time period). These types can be further broken down to at an overall level or at a store level as is shown in the chart below. Let me briefly try to explain the four scenarios with an example. This is equivalent to the LastNonEmpty aggregation type in SSAS multi-dimensional, where the last non empty date is calculated across all the stores within the selected time period and the values in that date are summed up. Here, as shown in the example, the last non empty value is calculated for each store within the selected time period and then summed up. The equivalent of this aggregation type in SSAS multi-dimensional has already been explained by Teo Lachev in this post. Here, the last non empty date is calculated across all the stores from the very first date in the database to the last date of the selected time period and the values in that date only are summed up. Note that the last non empty date need not belong to the selected time period here, as is seen from the values for C3 and C4. The equivalent of this aggregation type in SSAS multi-dimensional has already been explained by Chris Webb in this post. Here, the last non empty date is calculated for each store from the very first date in the database to the last date of the selected time period and the values in that date are summed up for each store. Note that the last non empty date need not belong to the selected time period here, as is seen from the values for C3 and C4. It is not possible to have a really well performing method in SSAS multi-dimensional for this aggregation type without insanely extrapolating the fact data; this leaves us with only the extremely slow choice of making a calculated measure. DAX is very powerful for performing such calculations and by the end of this series, you will see the performance gains that comes with having these scenarios in SSAS tabular. Let me go ahead and give the solutions for the first two types of Last Non Empty in DAX. I am using the Contoso database for my examples and they can be downloaded from this location. Performance wise, the results of both of them came back pretty fast and at almost the same time. It is interesting to note that we are using FactInventory[DateKey] to get the last non empty date at which data is present. If we substitute the date key from the fact with the dimension in the above formula, we will get the DAX formula equivalent to the LastChild aggregation type in SSAS multidimensional. The performance of all the formulas listed above were really good (all of them came back in 1 second). But the moment you add one more dimension to the formula (for eg, you need to find the last non empty for each store and product combination), there seems to be significant differences between the performance and I am currently doing some more testing on them (Well, might be a topic for another blog!). Meanwhile, you can go ahead and read the next part of this series in Javier’s blog. My company is awesome!!! Everyday that I go to work, I discover something new and exciting from the people around me and come back home thinking – wow, today was just legendary! The best part of the day is when I get to discuss ideas with my colleagues, it is so fulfilling intellectually. 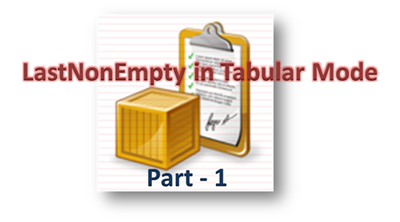 So last month, I was having one of those discussions with PowerPivot/Tabular expert and my colleague, Javier Guillen (blog | twitter) on Last Non Empty functionality in multi-dimensional and one thing led to the other. Before we knew, we had discussed a lot of interesting things in both multi-dimensional and tabular about the Last Non Empty functionality and I am pretty sure that you will hear a lot on that field from us soon. Meanwhile, I decided to blog a quick post on one of the basic principles that we will be using for that. 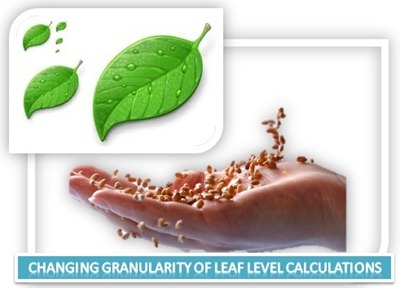 Leaf level calculations in multi-dimensional usually impact the performance and hence, are advised to be done in the ETL part. You might be lucky to get away with such sort of calculations in your DSV also as named calculations. But changing the granularity of such calculations from leaf level to an intermediate level usually requires it to be done in the ETL if we are using the multi-dimensional mode (unless you want to impact the performance by a Scope statement or god forbid, a cross join in the calculation script). In scenarios like prototyping where we are still discovering about the data, changing the granularity of the calculations can be expected and it implies a lot of time lost in re-working the ETL. That is where the Tabular mode is such a big boon and I will be illustrating that fact in the following example. Consider the AdventureWorks database where there is Order Quantity for the Products and Customers, and the client would like to see the distribution of products across the customers. Now you can make a simple numerical distribution measure which is the number of customers that have data for that product by the total number of customer. The result of the formula is given below and we can see that the new values takes the average from the territories at the country level. Now after making all these changes, the client is happy with the end results. The important thing to note here is that we had this whole hypothetical process completed within half an hour and not days. Consider how much time we would have required to accomplish this in the multi-dimensional mode! Now if you are still in the mood for more DAX after this, make sure that you run by Javier’s latest blog where he uses a similar technique to mimic the MDX Scope behavior in DAX. Set the Slice on your SSAS Cube Partitions now! I am pretty sure that most of you would have heard or read about this at least once in your SSAS career, but how many of you actually do set slices for your partitions? Well, I am also guilty of the charge and seldom did set slices till a recent issue. Situation : Duh, that’s strange! Now while I was going through the Profiler trace, I noticed something strange – three partitions (2005, 2006 and 2008) were being read while I expected just one partition (for 2008) to be read as my query just had April 2008 on the rows. Now, for people who are not familiar with Adventure Works cube, there are four partitions for the Internet Sales measure group, one for each year from 2005 to 2008 as shown below – I decided to take a detour from my actual purpose to investigate this issue. Debugging : Need to dig up that grave! I was aware that SSAS partitions generate automatic data slicers for each partition and these information are present in the info. *.xml file of the partition data file (you can find them usually at C:Program FilesMicrosoft SQL ServerMSAS10_50.MSSQLSERVEROLAPData folder followed by the cube, measure group and partition name if you haven’t changed the default settings. Note that I am using SQL Server 2008 R2). I decided to have a look at these three partition data files. It seemed like the auto-slices were not getting created for the 2005 and 2006 partition while it was being done for the 2008 partition. This was further confirmed on opening and inspecting the info. *.xml file with notepad. Knee-jerk Solution : Or is it? I went into research mode on Google and soon came up with a property in the msmdsrv.ini file which limits the creation of auto-slicers based on the number of rows in the partition – the IndexBuildThreshold property. By default, the value is 4096 rows and both the partitions for 2005 and 2006 had less than 4000 rows. This explained why the auto-slicers were not getting created and I modified it to 1000. Now on reprocessing the measure group, I was able to see that the auto-slicers were generated in the partition data files and only the correct partition was being read in the profiler trace. Actual Solution : The real deal! I decided to gloat over my findings to my friend and colleague, Javier Guillen (blog | twitter) who was sitting in the next room. When I described the problem statement to him, the very first question he asked me was whether I had set the partition slices, and I was like – sheesh, I missed on that cardinal rule, as usual. I was under the impression that as long as your partition is for a single data member (as in this case – a single year), it should work. But later I found out that partitions for which autoslices are not generated will be scanned anyway, unless the partition slices are explicitly defined. I went back and set the slices for each partition correctly to their respective years and also reverted the IndexBuildThreshold property to the original value of 4096. Once this was done, I processed my measure group and found out that only the correct partitions were being read from the trace files. I took some time to read and learn more about partition slices, thought you would be interested in it too if you made it this far. There is an overlap of Scenario 1 and Scenario 2 for Local SKU and Nielsen SKU views but the resultant views are the same. These views are repeated in this post just for completeness of Scenario 2. In the view for Brand Pack attributes, it might look like Scenario 3 applies at Brand Family level. But Scenario 3 needs an extra condition to be satisfied which is not done here. This will be explained in detail in the next post. General rule for each individual view in Scenario 1 and Scenario 2 is to select all the attributes from the table which has children at the lowest level of that view. For eg, in the view for Brand Pack attributes, all Brand Sub Families would be present which have Brand Packs. If there is a Brand Sub Family which doesn’t have a Brand Pack, it will not be present in the view. But that particular value of Brand Sub Family can be safely omitted as there are no facts coming in at a Brand Sub Family level and hence it would not be needed for analysis (in most of the cases). This general rule would not be applicable to Scenario 3 and would be explained in the next post. Meanwhile, as usual, let me know till what level you agree or disagree on these points.